The Third-Generation Type 90 Kyū-maru (90式戦車 Kyū-maru-shiki-sensha) was developed to match the western power’s most up-to-date Main Battle Tanks, namely the American M1 Abrams, and the German Leopard 2. It would bolster the Japanese Ground Self-Defense Force’s armored units as they phased out the Type 61, and reduced the number of operational Type 74s. The Type 90’s design process started right after the Type 74 entered service, with the first specifications drawn up in 1980. Before that, it was thought the T-72 was equal if not superior to the Type 74 in some areas. Mitsubishi Heavy Industries, the backbone of Japanese Tank design, joined forces with the TRDI (Japan Defense Agency’s Technology Research and Development Institute) to design the TK-X MBT, which was later tested in 1976-1977. Other subcontractors joined the process, including Japan Steel Works, Daikin Industries, Mitsubishi Electric, Fujitsu, and NEC. The great novelty was, of course, the 120 mm gun, ready and tested in 1982. 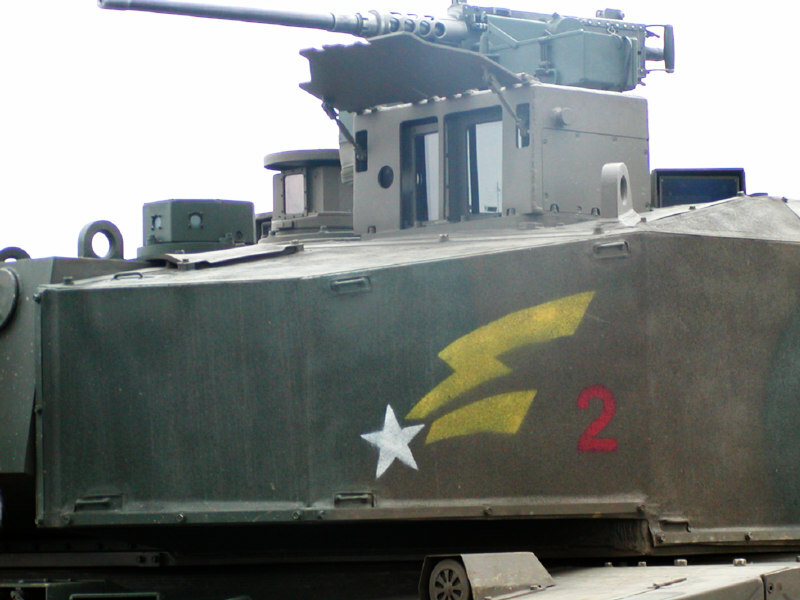 It was, in fact, the German-designed Rheinmetall L44 found on the Leopard 2 and M1 Abrams. It was manufactured under license by Japan Steel Works Limited and fired ammunitions by Daikin Industries Limited. In 1984, tests were terminated, while other departments were developing the Turret and Modular type ceramic composite armor until 1986. In 1986-88, the second wave of prototypes was built and tested in 1989. This run of prototypes produced the final pre-production prototype. The first production of 30 vehicles left the Mitsubishi factory lines at the beginning of 1990. The hull (entirely welded, with Japanese very high-quality steel RHA) is given a very sloped, almost flat glacis, like its contemporaries such as the Abrams. The driver, positioned in the front left, is given a sliding hatch and three periscopes, with a central day/night sight. The gunner is located right behind him in the turret, and has his own one-piece hatch and vision unit, with a digital IR sight of 10x magnification and rangefinder display. The commander is located on the right, and have its own cupola with height vision blocks and his own periscopic sight with 3×/10× (day-only magnification). The later has a −29 to +29 degrees elevation and 180 degrees traverse. Generally speaking, the Type 90 remains smaller than the Abrams and Leopard 2 and is quite as fast as the best Russian tanks. The general design of the turret is reminiscent of the Leopard 2A1-A4 with a slab-sided modular assembly. The Exact composition of the armor remains classified but comprises sandwich structures with ceramic and steel, possibly steel alloys and other composites. Damaged blocks can be easily removed and replaced in the field. The crew has full NBC (nuclear, biological, chemical) protection comprised of a collective system with overpressure and crew compartment and engine compartment automatic detector/fire extinguishers. The hull’s sides are protected by side skirts. The turret front is proof against JM-33 120 mm APFSDS projectiles (fire by the “short” L44 gun) and sides can defeat up to 35 mm APDS rounds (Equivalent to 90 millimeters of RHA at 1,000m). The only foreign part in the tank is the German Rheinmetall 120 mm also shared by the Leopard 2, M1A1/A2 Abrams and Korean K1A1. It allows full NATO standard ammunition compatibility. The great novelty, however, is the use of a Mitsubishi-designed mechanical bustle autoloader of the conveyor-belt type. It allows the reduction of the turret size and crew. All the rear of the turret is therefore used for storage of the 120 mm rounds, with blow-off panels for extra security. The reloading rate varies. It can be as fast as just 2 seconds of during sustained fire, while the complete loading and firing cycle for one given target is around 4–6 seconds for a well-trained crew. A Type 90 at the 2009 Firepower in Fuji event firing its main Armament. Secondary armament comprises a coaxial 7.62 mm light machine gun left of the main gun (firing tracers), and the roof multipurpose 12,7 mm Browning M2HB (cal.50) licensed for production to the Sumitomo Heavy Industries. It is placed on a pintle between the commander and gunner’s hatch, slightly offset to the left. Ammunition provision comprises 39 rounds for the main gun, 1,500 for the heavy machine gun and 2,000 for the coaxial. Extra protection is given by two banks of smoke dischargers, three or four each, firing smoke rounds for concealment. There is no confirmation they can also fire AP grenades or IR flares. The Japanese fire-control system was upgraded since 1990 and now comprises a Yttrium-Aluminium-Garnet laser rangefinder (300 – 5,000 m range) and a 32-bit ballistics computer. Improved thermal imaging systems and displays were also fitted and the FCS is given an auto-tracking system (to engage moving or stationary targets at speed, day or night/low visibility) improved gun stabilization. The target tracker thermal image display is shared and controlled by tank gunner and commander, but there is no confirmation of a hunter-killer mode. It is likely that sensors, displays and battlefield data management will pass from the Type 10 to the Type 90 in the near future. The Type 90 receive a Mitsubishi 10ZG32WT, a 10-cylinder, two-stroke cycle diesel which develops 1,500 hp (1,120 kW output). It is coupled with a Mitsubishi MT1500 automatic transmission (4 forward, 2 reverse gears). The development of the new powerpack began as early as 1978 and was achieved in 1982. It provides an acceleration of 0–200 m in 20 seconds. The Suspension keeps the same abilities as the Type 74’s but is a slightly less complex hybrid system with hydropneumatic units only on the front and rear road wheels pairs. They can be adjusted on-the-fly by the driver to tilt the tank either forwards and backward, or left and right. The other wheels are all on standard torsion bars. At the exception of the German gun, the local and limited production of the tank traduced by much higher unit cost than other NATO models but perhaps the French Leclerc (Price tag is 790 million Japanese yen =7.4 million 2008 USD). Upgrades were delayed due to budget restraints, and as all pr priority was given to the new Type 10 MBT. 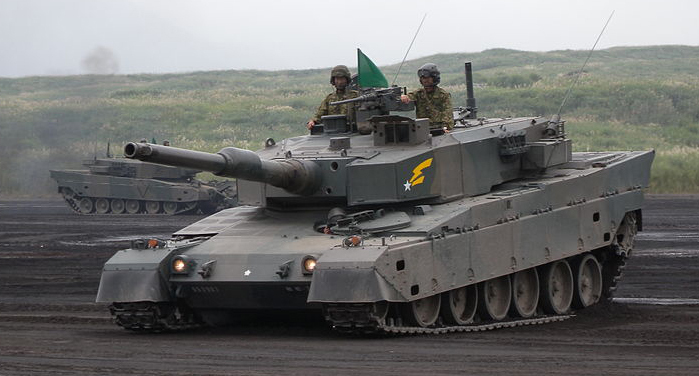 Today, the Type 90 are rather assigned to the JGSDF Fuji School Brigade and 7th Armored Division in Hokkaido to take advantage of the nature of the terrain and space. The Type 10 is far better conceived to operate in urban environments and therefore took its place in those units. The Type 90 participated in large (sometimes joint, combined and abroad) training exercises annually, such as at the Yakima Training Center in Washington State. 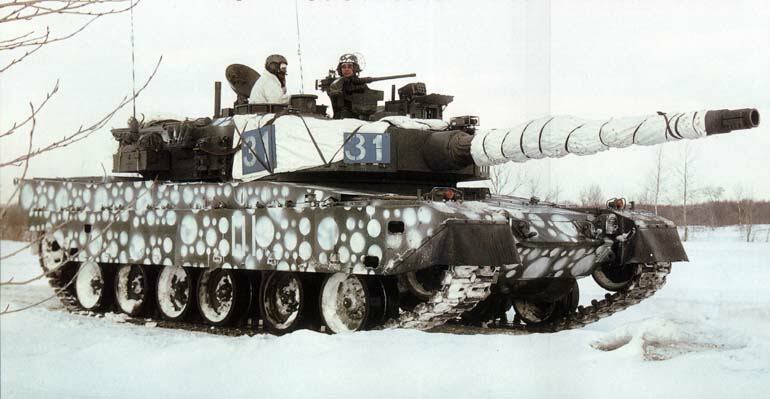 Type 90 in winter camouflage taking part in training. But so far this MBT remains untested and was never deployed overseas in military operations, even for peacekeeping duties. 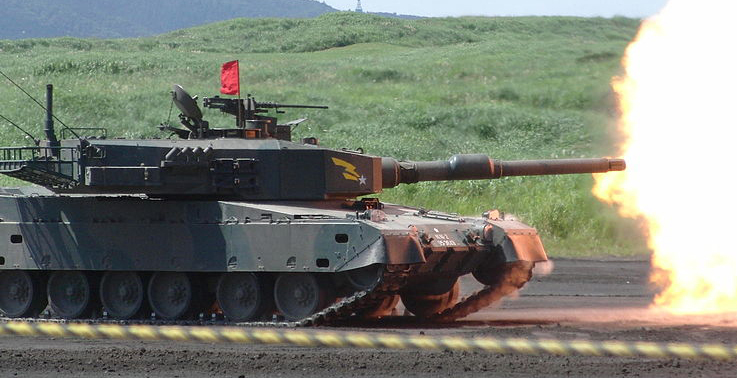 The Type 90 has been criticized after its introduction because of its overall weight, much superior to the Type 75, that imposed rethinking all of the transportation chains, and was, therefore, constraints in Hokkaido since. It could operate on around 65% of Japanese main bridges, which reduced its tactical mobility compared to its predecessor, but it’s still much better than the 55-59 tonnes range of most NATO’s MBTs. Type 90 Bridgelayer: A variant with main-armament removed and equipped with scissors-blade bridge laying system. 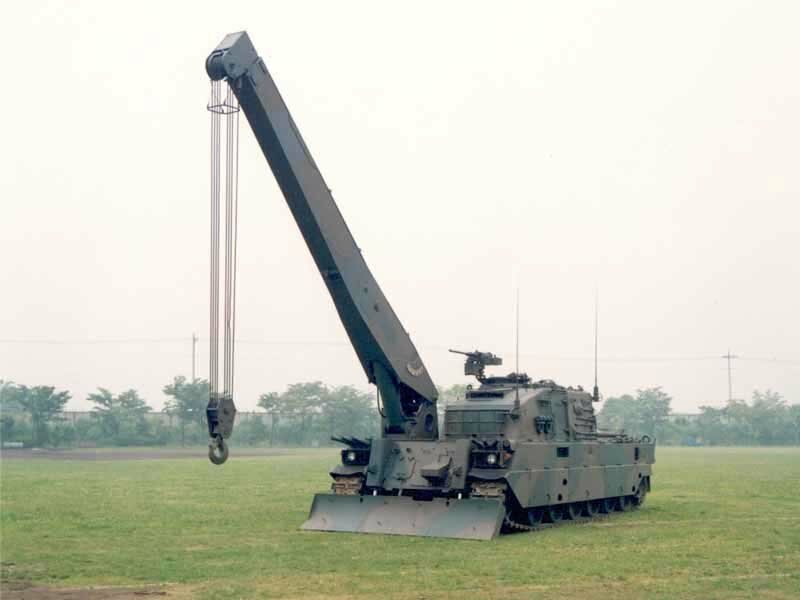 Type 90 ARV: This is an Armored Recovery Vehicle variant, equipped with a heavy-lift boom arm and dozer blade. The Type 90 on GlobalSecurity.org. Postwar Japanese Tanks, Kamado Publishing, Aug. 2009. Type 90 of the early type, with the horizontal x4 type smoke dischargers. Type 90 of the late type, with the vertical x3 type smoke dischargers. Illustrations by Tanks Encyclopedia’s David Bocquelet. Will there be a article on the Type 10? In a way, yes, but as the Type 74 is now slowly being withdrawn, the Type 10 will start filling the gaps along with the Type 16 MCV (Article in writing). There is a typo under the header “Propulsion” in the third sentence of the first paragraph. It reads: “The development of the new powerpack began as easy as 1978 and was achieved in 1982.” Replace the word “easy” with “early”. 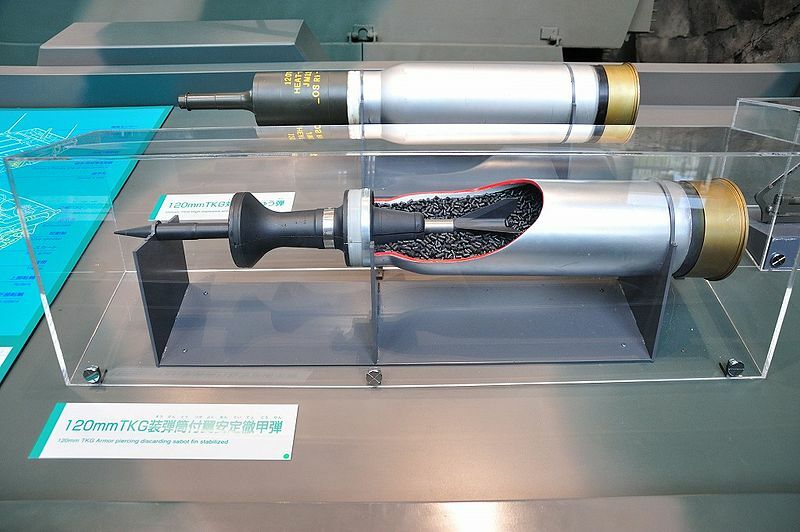 I can’t find any infos about the jm122 apfsds. Where can i find em?